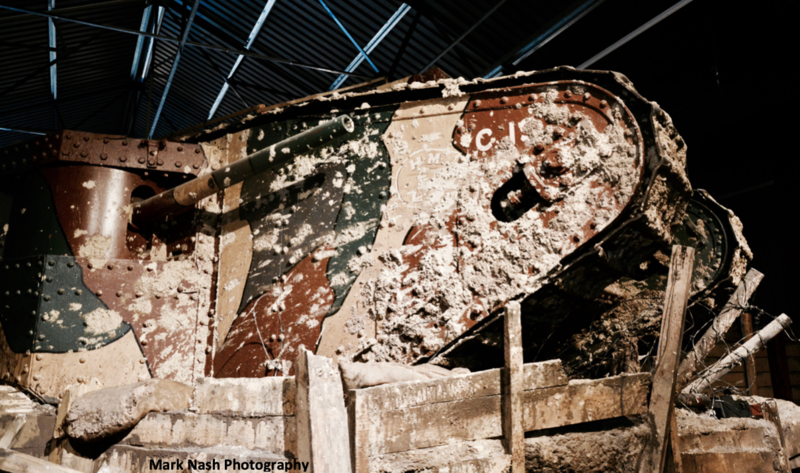 In April 1917, World War I was in full swing with devastating losses on the Western Front and the United States had just declared war on Germany. Tanks had started to be used in combat and generated an enormous amount of interest in the newspapers, magazines, and newsreels of the day. The result was a response from the inventive minded members of the public to get creative with many of their own designs. One of these designs came from the hand of Stephen Kupchak, a British citizen living in Rosevear, Alberta, Canada, who submitted his design for a patent on the 17th April 1917 in the USA. Kupchak did not call his tracked machine a tank though, instead, he called it a ‘War-Automobile’. Although it was never built, it remains an interesting development at a time of great inventiveness and learning in the rights and wrongs of tank design. The basic shape of the machine is crude, a giant box on tracks. Kupchak has adopted a rounded front with vertical faces which extended along the sides and a vertical rear. The structure was made of “suitable armor plate” of an unspecific thickness. Inside the curved front section, was mounted a “rapid fire gun mounting a silencer”, although a caliber was not specified. Access to the machine would be provided by two large rectangular doors in the sides located in the front half of the vehicle. On the roof of the machine was a “conning tower” fitted with a variety of slots for the commander to see out of. It is not mentioned if it rotatable and, as no firing ports are obvious in the drawings, it would appear to have been simply for observation. Holt suspension seen from the side is quite noticeably very different to the Kupchak design with multiple small wheels and with track tensioning taking place at the end idler. Illustration of the Kupchak War Automobile. Produced by Bernard ‘Escodrion’ Baker, funded by our Patreon Campaign. Online it has been said that the chassis on which the ‘tank’ is based is that of the Holt tractor, but this is not described in this way in the 1917 US patent filing. The patent spends a lot of time describing the track mechanisms stating the added advantage that it could be tensioned from inside the machine without getting out. 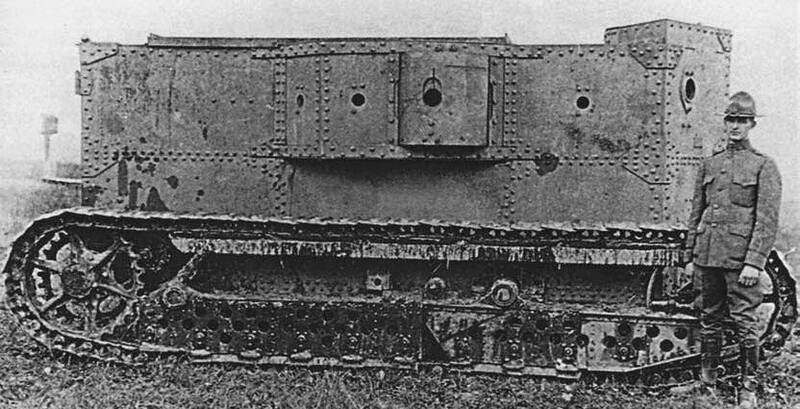 Certainly, in 1917, this was something which could not be done on the existing British tank models and had the advantage that the crew would not be exposed to fire just to tension the track. The track tensioning system of the Kupchak design was crude but ingenious, and completely different from that of the Holt chassis, showing that whatever relationship this design had to the Holt was superficial at best. Unlike a British tank of the period, which used a large adjusting nut from outside to move the entire idler further out, Kupchak instead opted for an unusual winding system. The three extremely small wheels, which also provided the suspension for the machine, were mounted on a vertical rod which could move up and down with undulations in the ground and return to position via a spring. The initial position, however, was modified by means of a winding handle operated from inside the machine. This had the effect of jacking the machine further up on the wheel meaning the track-run was longer and thus tensioning the track in the process. Quite how practical this system would actually have been, or whether, indeed, it could even work, is not clear, as there is no additional gearing to provide the mechanical advantage which might be needed to elevate a heavy vehicle in such a way. The Kupchak design is hard to judge. Clearly, it was drawn at a time when tank technology was in its infancy and has significant problems, but it also offers an interesting insight into the technology available at the time. The problems of tightening tracks and providing suspension for a track-laying vehicle were clearly not completely understood, yet the solutions are both inventive and unusual. Tim Rigsby, in ‘WW1 Landship Design’, states that Kupchak was one of the designers (with responsibility for the hull) for a rejected 200 ton ‘Trench Destroyer’ idea and that he submitted the design of his vehicle to the British War Office in 1918. According to Rigsby, the War Office did not reject it, but simply asked for a full-size machine for demonstration purposes to be built, something that Kupchak, with limited resources, could not do. Thus, according to Rigsby, the project died but none of that account can be verified and is still being investigated. In the conclusion something is mentioned about a 200 ton “Trench Destroyer.” Are we gonna see and article on that?